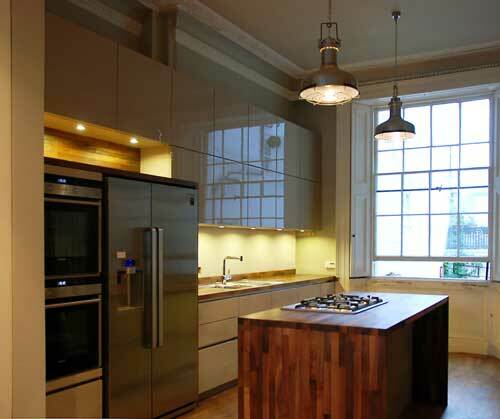 Handleless kitchen cabinets cashmere lacquer with solid walnut worktops, in Brighton. Being installed within in a Grade 1 listed property in one of the oldest, most prestigious buildings in Brighton this kitchen had to be sensitive to the character of the building. Our client wanted their new kitchen to occupy less space than the existing one, in order to free up space for a small table and also make the cooking zone more compact and easier to use. The design had to incorporate a washing machine, dishwasher, American fridge freezer, wine fridge, two ovens, not to mention a boiler and water tank. In terms of style they wanted something with both subtlety and elegance that would do justice to the building. Whilst the left-hand wall served as a useful preparation area the right hand wall, seen in the image above, was messy and awkward. The plan was to try and create more of ‘work-centre’ where it was possible to access everything in the kitchen without having to take more than a few steps. Every now and again, you walk into a space and an idea just hits you, this was one of those wonderful occasions. On first visiting the property the height of the rooms, coupled with the extraordinary ceiling detail, meant this kitchen had the chance to be something a little bit different. With such an abundance of height the eye just couldn’t help but be drawn up. We settled on an idea to build a double height bank of wall units, which would not only house the boiler but would also step up at one end to allow the American fridge-freezer and ovens to sit alongside the sink section of worktop. A small island would provide further prep space, room for the hob and a place to sit and socialise. In terms of cabinetry, the furniture was to be handle-less, high gloss cashmere lacquer. The original idea was to have contrasting white wall units but in the end the decision was taken to settle on one colour throughout. The major feature in the kitchen was to be the solid walnut block worktops and framing. The timeless beauty of the wood being both a sympathetic, nod to the age and character of the building as well as a wonderfully tactile material that only gets better with time. Described by our chief fitter as ‘a wall of awesomeness’ this kitchen delivers an impact that bellies its apparent simplicity. 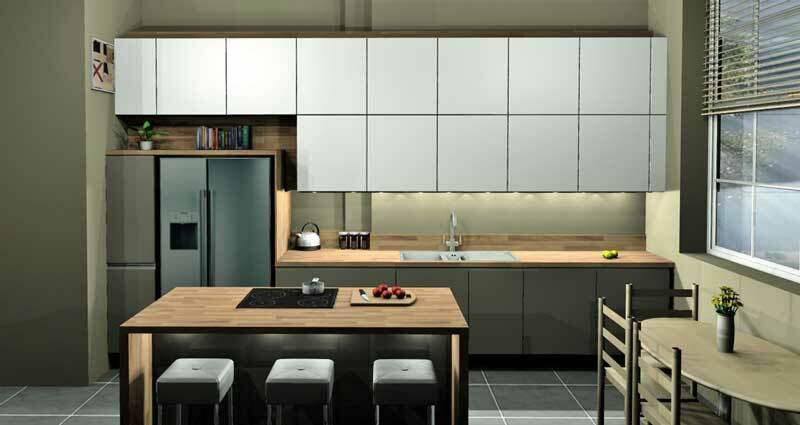 The high gloss furniture and the wooden elements combine together perfectly to deliver a kitchen that really does do justice to the property. The feature wall units provide great storage, as well as hiding the boiler, but they also draw the eye upwards, as intended, to the wonderful ceiling detail. A pair of old ship lights hang from the ceiling with additional task lighting coming in the form of LED down-lights, integrated into the wall units. The feature walnut worktop and framing add a luxury feel to the kitchen with details like the panelled area above the fridge and ovens providing additional visual interest, as well great storage for books and a stereo. Whilst it can seem the obvious thing to do in a period property is to install a new kitchen that ‘pretends’ to be old, thankfully our clients on this job were determined not to fake anything. In the same way that using a different type of brick to repair a building allows the building to be read like a diary, having the confidence to let the old integrate with the new is often how original architecture is most honestly preserved. Just as the original period detailing is a true reflection of its time, this is a kitchen that is proud to be of the now.